Did you Know about spectacled bear? Did you know The spectacled bear (Tremarctos ornatus), also known as the Andean bear and locally as “Oso de anteojos” is the last remaining short-faced bear and the closest living relative to the Florida spectacled bear and short-faced bears of the Middle Pleistocene to Late Pleistocene age. In other words, spectacled bears are the only surviving species of bear native to South America, and the only surviving member of the subfamily Tremarctinae. Spectacled bears are more herbivorous than most other bears; normally about 5 to 7% of their diets is meat and is technically the largest land carnivore on that continent. Compared to other living bears, this species has a more rounded face with a relatively short and broad snout. In some extinct species of the Tremarctinae subfamily, this facial structure has been thought to be an adaptation to a largely carnivorous diet, despite the modern spectacled bears’ herbivorous dietary preferences. Although spectacled bears are solitary and tend to isolate themselves from one another to avoid competition, they are not territorial. Mating may occur at almost any time of the year, but activity normally peaks in April and June, at the beginning of the wet season and corresponding with the peak of fruit-ripening. The mating pair are together for one to two weeks, during which they will copulate multiple times. Births usually occur in the dry season, between December and February. From one to three cubs may be born, with four being rare and two being the average. The cubs often stay with the female for one year before striking out on their own. Like other bears, mothers are protective of their young and have attacked poachers. The only predators of cubs are cougars (Puma concolor) and jaguars (Panthera onca). Lifespan in the wild has not been studied, but bears are believed to commonly live to 20 years or more unless they run afoul of humans. The longest-lived captive bear, at the National Zoo in Washington, DC, attained a lifespan of 36 years and 8 months. Despite some spilling over rarely into eastern Panama (Darien), Spectacled Bears are mostly restricted to certain areas of northern and western South America. The specie is found almost entirely in the Andes Mountains. Before spectacled bear populations became fragmented during the last 500 years, the species had a reputation for being adaptable, as it is found in a wide variety of habitats and altitudes throughout its range, including cloud forests, high-altitude grasslands, dry forests and scrub deserts. The best habitats for spectacled bears are humid to very humid montane forests. Generally, the wetter these forests are the more food species there are that can support bears. Occasionally, they may reach altitudes as low as 250 m (820 ft), but are not typically found below 1,900 m (6,200 ft) in the foothills. They can even range up to the mountain snow line at over 5,000 m (16,000 ft) in elevation. 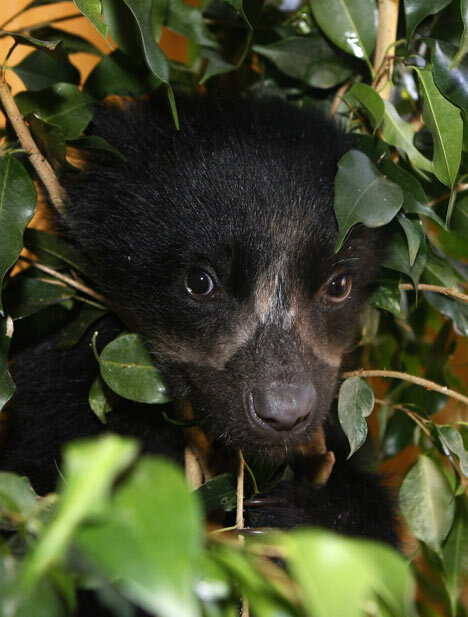 The spectacled bear population is under threat for a number of reasons. Unfortunately, still no species-level conservation efforts are known to exist for Spectacled bears. The bears are hunted by locals due to a belief they will eat livestock (although spectacled bears do not normally eat large quantities of meat). Their gall bladders (biliary vesicle) are also valued in traditional Chinese medicine and can fetch a high price on the international market. Perhaps the most epidemic problem for the species is extensive logging and farming, which has led to habitat loss for the largely tree-dependent bears. Legislation against hunting the bears exists, but is rarely enforced. The IUCN has recommended the following courses for Spectacled bear conservation: expansion and implementation of conservation land to prevent further development, greater species level research and monitoring of trends and threats, more concerted management of current conservation areas, stewardship programs for bears which engage local residents and the education of the public regarding spectacled bears, especially the benefits of conserving the species due to its effect on natural resources.